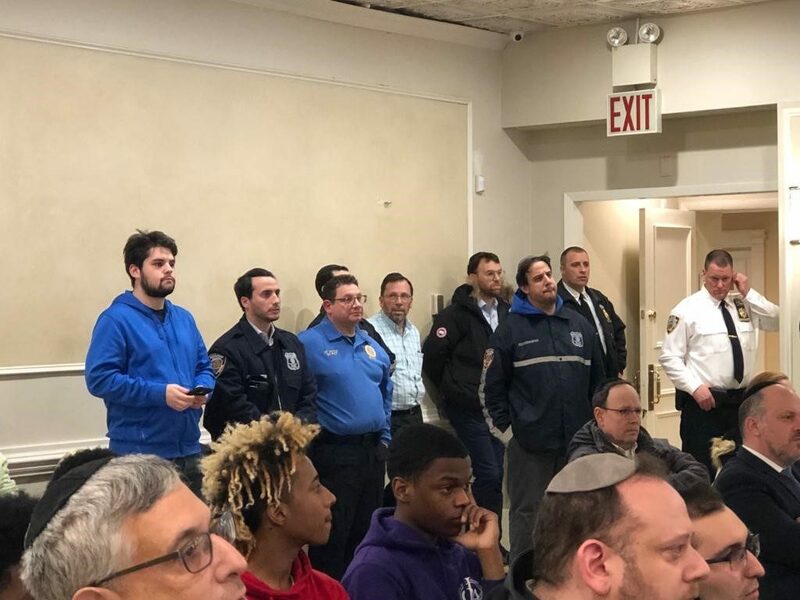 Following the horrific tragedy in Pittsburgh and rise in antisemitic hate crimes, community members from all different backgrounds came together for a lifesaving educational evening, an NYPD active-shooter training workshop. The event was coordinated by devoted community leader Councilman Donovan Richards (NYC Council D-31), chair of the Public Safety Committee. Chaim Leibtag, representing the White Shul, opened up the evening by thanking the NYPD for their protection and involvement. Chaim then welcomed everyone to the White Shul and introduced the executive director of the JCCRP, Moshe Brandsdorfer. The introductory speakers included Councilman Richards, Assemblywoman Stacey Pheffer Amato who was a co-host of the event, and Deputy Inspector Vincent J. Tavalaro, commanding officer of the 101st precinct. The deputy inspector spoke about taking proactive steps to ensure that your school, workplace, and shul are safe. “We have units devoted to conducting security assessments for your facilities. Take advantage of these free services,” commented DI Tavalaro. Councilman Richards spoke about the strong relationship that exists between the local NYPD precinct and the community, one that everyone benefits from. The councilman spoke about being proactive and vigilant with security measures, something everyone can do. The interactive program was then presented by Officer Gibbons, of the NYPD Counter Terrorism Division. Officer Gibbons covered many of the various scenarios and statistics surrounding active shooters in the past number of years. The officer presented many real situations educating everyone on what to do if they are in an active-shooter situation. Officer Gibbons spoke about measures that can be taken to prevent an active-shooter situation. For example, generally each active shooter displayed four to five concerning behaviors over time that were observable to others around the shooter. The most frequently occurring concerning behaviors were related to the active shooter’s mental health, problematic interpersonal interactions, and leakage of violent intent. Being aware of these changes in behaviors can be very effective in thwarting an attack. The session ended with an interactive and lively Q&A session. The community is very appreciative to the NYPD, 101st Precinct, and all of the political leaders who hosted the event including NYS Senator Joseph P. Addabbo (D-15th NYS Senate District), NYS Senator James Sanders Jr. (D-10th NYS Senate District), Assemblywoman Stacey Pheffer Amato (D-23rd NYS Assembly District), Congressman Gregory Meeks (D-5th Congress District), Councilman Donovan Richards (D-31st NYC Council), and his dedicated chief of staff, Manuel Silva. It is everyone’s hope and prayer that this workshop was conducted only for educational purposes and that the information will never need to be utilized.